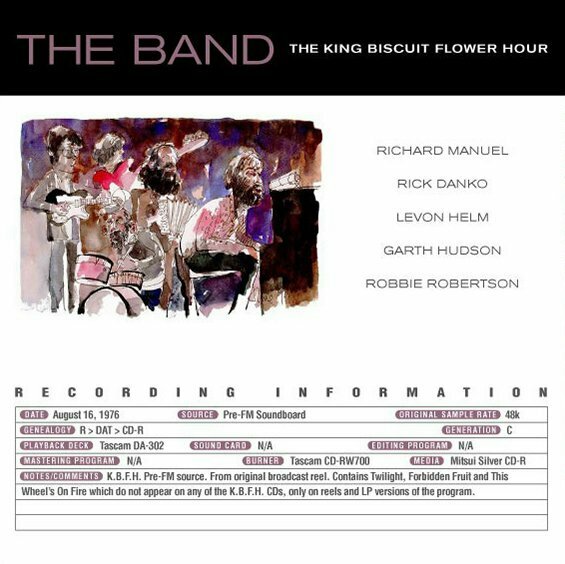 Endless Highway: The Music of The Band, a tribute to The Band, was released on January 30, 2007. But then, this whole thing works. Guster’s reverent and moving read of “This Wheel’s on Fire,” opens the set; it’s a beautiful place to start because it’s followed in true Band fashion by Hornsby’s swinging, funky rendition of “King Harvest,” only to be underscored by My Morning Jacket’s “It Makes No Difference.” It’s true that nobody could sing this song like Rick Danko, but it’s played with such understated passion and tension that it’s as necessary a cover as there ever has been. While everybody refers to the Staple Singers cover of “The Weight,” Lee Ann Womack brings the song back to its country roots with a vengeance It’s still a back porch gospel tune, but Womack underscores the rural grit in the tune. Wow! Gomez count the Band among their many influences and have been playing its songs for over a decade. 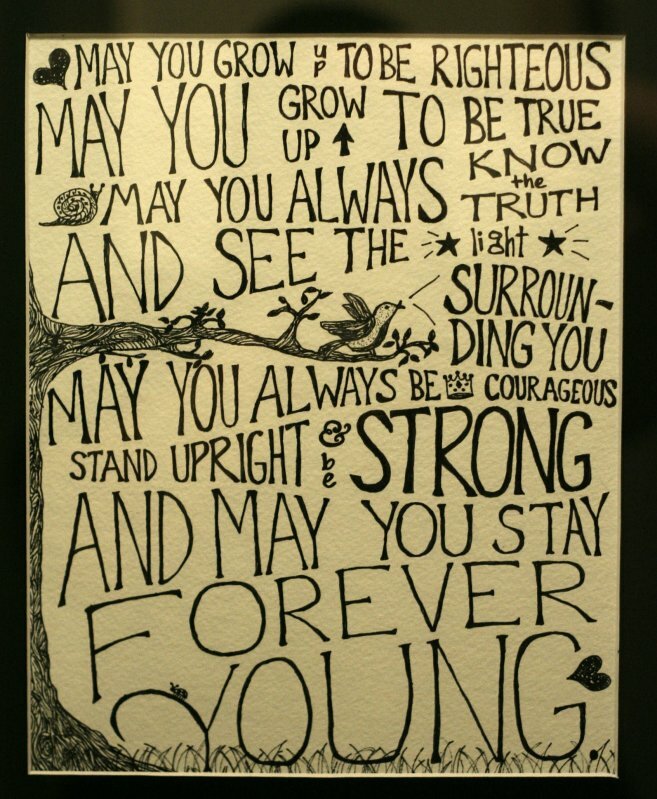 Their version of “Up on Cripple Creek” is a testament to this. It’s not radically re-interpreted, but as an English band, these cats get the hip and greasy funkiness in the original and bring it out. The live version of “The Night They Drove Old Dixie Down,” sung by Gregg Allman, is slow, ragged, and close to stunning. One would have to say that the Roches have been destined by God to cover “Acadian Driftwood.” While it is inextricably linked to the Band’s drummer Levon Helm, the Roches add a completely different spin on this with their wistful, female take on the dislocation, exile, and regret. Attention please: This is a bootleg … an audience recording from 1969 … ! Music from Big Pink is the debut studio album by the Band. Released in 1968, it employs a distinctive blend of country, rock, folk, classical, R&B, and soul. The music was composed partly in “Big Pink”, a house shared by Rick Danko, Richard Manuel and Garth Hudson in West Saugerties, New York. 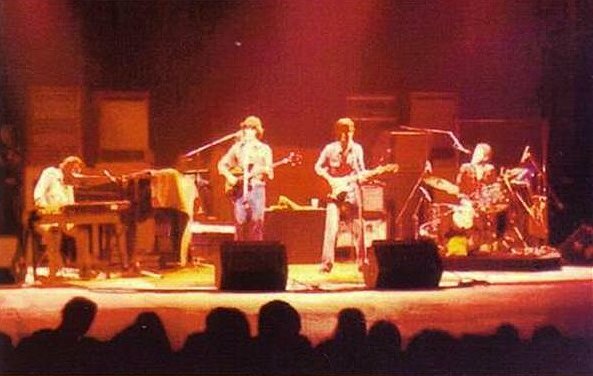 The album itself was recorded in studios in New York and Los Angeles in 1968, and followed the band’s backing of Bob Dylan on his 1966 tour (as the Hawks) and time spent together in upstate New York recording material that was officially released in 1975 as The Basement Tapes, also with Dylan. 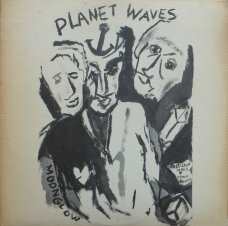 The cover artwork is a painting by Dylan. The Band began to create their distinctive sound during 1967, when they improvised and recorded with Bob Dylan a huge number of cover songs and original Dylan material in the basement of a pink house in West Saugerties, New York, located at 56 Parnassus Lane (formerly 2188 Stoll Road). The house was built by Ottmar Gramms, who bought the land in 1952. The house was newly built when Rick Danko found it as a rental. Danko moved in along with Garth Hudson and Richard Manuel in February 1967. The house became known locally as “Big Pink’ for its pink siding. The house was subsequently sold by Gramms in 1977, and since 1998, it has been a private residence. Though widely bootlegged at the time, the recordings Dylan and the Band made were first officially released in 1975 on The Basement Tapes, and then released in their totality in 2014 on The Basement Tapes Complete. By the end of 1967 The Band felt it was time to step out of Dylan’s shadow and make their own statement. The Band’s manager Albert Grossman (who was also Dylan ‘s manager) approached Capitol Records to secure a record deal for a group still informally described as “Dylan’s backing band”. Stanley Gortikov at Capitol signed The Band—initially under the name The Crackers. Armed with news of a recording deal for the group, they lured Levon Helm back from the oil rigs where he had been working, to Woodstock where he took up his crucial position in the Band, singing and playing drums. Helm’s return coincided with a ferment of activity in Big Pink as the embryonic Band not only recorded with Dylan but also began to write their own songs, led by guitarist Robbie Robertson. Capitol were so pleased with the initial recording session, they suggested the group move to Los Angeles to finish recording their first album at Capitol Studios. They also cut some material at Gold Star Studios on Santa Monica Boulevard. The songs on Big Pink recorded in L.A. were “In A Station”, “To Kingdom Come”, “Lonesome Suzie”, “Long Black Veil” and “I Shall Be Released”. Dylan offered to sing on the album, but ultimately realized it was important for the Band to make their own statement. Instead, Dylan signified his presence by contributing a cover painting. Barney Hoskyns has written that it is significant the painting depicts six musicians. The cover of Music From Big Pink was intended to establish the group as having a different outlook from the psychedelic culture of 1968. Photographer Elliott Landy flew to Toronto to photograph the assembled Danko, Manuel and Hudson families on the Danko chicken farm. A photo was inserted of Diamond and Nell Helm, who lived in Arkansas. The photo appeared on the cover with the caption “Next of Kin”. The initial critical reception to the album was positive, though sales were slim. In Rolling Stone, Al Kooper’s rave review of Big Pink ended with the words, “This album was recorded in approximately two weeks. There are people who will work their lives away in vain and not touch it.” which helped to draw public attention to it (even though Rolling Stone referred to them as “the band from Big Pink” instead of just “the Band”). The fact that Bob Dylan wrote one and co-wrote two of the songs on the album also attracted attention. In 1968, “The Weight” peaked at #63 on Billboard’s Hot 100 singles chart in the US. The song was a bigger hit elsewhere, peaking at #35 in Canada, and #21 in the UK. The album peaked at #30 on Billboard’s Pop Albums chart in 1968, and then recharted as a #8 hit on the Top Internet Albums chart in 2000 (see 2000 in music). “The Weight” gained widespread popularity, from the Band’s performance of it at Woodstock on 17 August 1969 and due partially to its inclusion in the film Easy Rider, though it was omitted from the soundtrack because of licensing issues. A cover version by the band Smith was included on the soundtrack album instead. This was The Band near the end of their run. 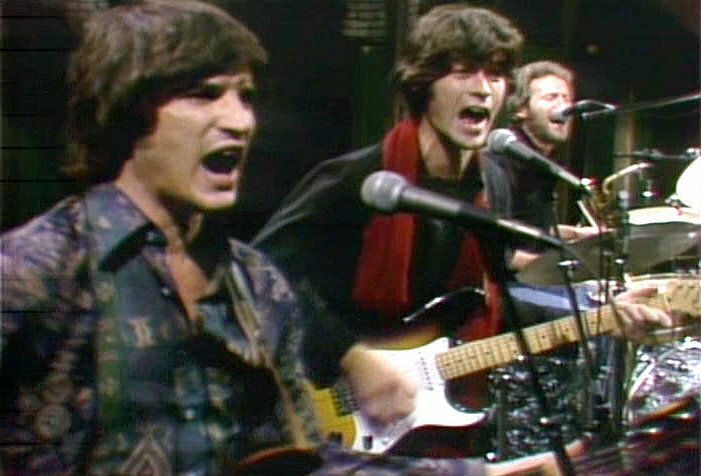 They were just weeks away from their final concert (which became the overstuffed movie The Last Waltz) and Robbie Robertson left the band shortly after. 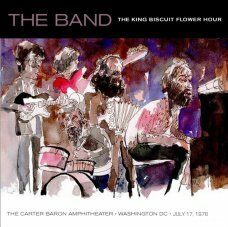 This recording shows them as seasoned vets, playing material they’d been comfortable with for years.” Note: per the Bill Graham Archive, the actual date of this performance is now assumed to be 17 July 1976, not 16 August 1976 as stated in Band books and on King Biscuit Flower Hour bootlegs. 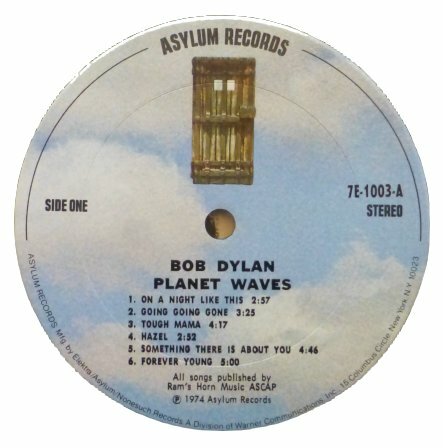 Planet Waves is the fourteenth studio album by American singer-songwriter Bob Dylan, released on January 17, 1974 by Asylum Records in the United States and Island Records in the United Kingdom. Dylan is supported on the album by longtime collaborators The Band, with whom he embarked on a major reunion tour following its release (documented on the live album Before the Flood) (the tour started a couple weeks before release—though Asylum did want the album out first). 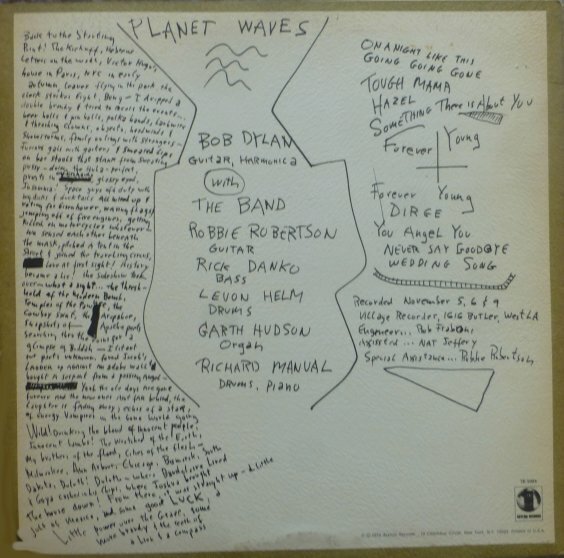 With a successful tour and a host of publicity, Planet Waves was a hit, enjoying a brief stay at #1 on the US Billboard charts—a first for the artist—and #7 in the UK. Critics were not as negative as they had been with some then-recent Bob Dylan albums (namely Self Portrait and Dylan), but still not enthusiastic for the album’s brand of laid-back roots rock. The album was originally set to be titled Ceremonies of the Horsemen, a reference to the song “Love Minus Zero/No Limit”, from the 1965 album Bringing It All Back Home; the release was delayed two weeks when Dylan decided to change the title at the last minute. Another, earlier working title was Wedding Song.